Objective: The objective of this study is to compare the cyclic fatigue resistance of nine types of endodontic instruments of nickel–titanium. 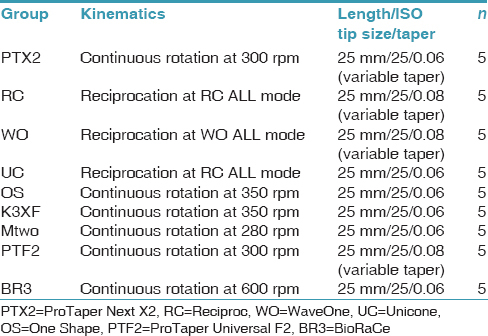 Materials and Methods: Five files of 25 mm of length of each group: Reciproc (RC) R25; WaveOne (WO) Primary; Unicone (UC) L25 25/0.06; K3XF 25/0.06; ProTaper Universal F2 (PTF2); ProTaper Next X2 (PTX2); Mtwo 25/0.06; BioRaCe 25/0.06; One Shape L25 25/0.06 were subjected to a cyclic fatigue resistance test on a mechanical apparatus. The mean fracture time was analyzed statistically by one-way analysis of variance and Tukey's honest significant difference post hoc test, with significance set at P< 0.05. Conclusion: It was observed that the groups PTX2, RC, R25, UC L25 25/0.06, and WO Primary presented greater cyclic fracture resistance than the other groups (P< 0.001). The files fracture mechanisms are classified into two types in literature, fracture caused by cyclic fatigue (flexural) fracture or by torsion., The cyclic fatigue fracture occurs when the instrument is subjected to repetitions of cyclical tension and compression, causing microcracks to form in its structure and finally resulting in file separation. These repeated cycles of tension and compression caused by the rotation of curved instruments increase cyclic fatigue failure over time, and may be an important factor for fracture. Fracture caused by torsion occurs when a part of the metal is fixed in position, whereas the rest of the instrument continues to rotate around its longitudinal axis., The cyclic fracture is a major cause of fractures and currently one of the most studied topics with respect to NiTi rotary instruments. There are on the market a variety of these instruments-driven motor with different kinematics, compositions, and shapes, which are gaining increasing acceptance and popularity among specialists. Considering these information and the importance to know more about the existing endodontic files on the market, the purpose of the present study was to evaluate the cyclic fatigue resistance of different endodontic instruments of reciprocating movement and continuous rotary motion. To conduct this experiment, a total of 45 NiTi rotary files, ISO tip size of 25 were used, taper 0.06% or 0.08% and length of 25 mm. These were divided into nine experimental groups (n = 5 each) of different types of endodontic files. Each endodontic file of a specific group is named according to the type of file and used a number from 1 to 5, where Group 1 was ProTaper Next X2 (PTX2) (Dentsply Maillefer, Ballaigues, Switzerland), Group 2 Reciproc (RC) R25 (VDW, Munich, Germany), Group 3 WaveOne (WO) Primary (Dentsply Maillefer, Ballaigues, Switzerland), Group 4 Unicone (UC) L25 25/0.06 (MEDIN SA, Nové Město na Moravě, Czech Republic), Group 5 One Shape (OS) L25 25/0.06 (Micro-Mega SA, Besançon, France), Group 6 K3XF 25/0.06 (Sybron Dental Specialties, Orange, CA, USA), Group 7 Mtwo 25/0.06 (VDW, Munich, Germany), Group 8 ProTaper Universal F2 (PTF2) (Dentsply Maillefer, Ballaigues, Switzerland), and Group 9 BioRaCe (BR3) (FKG Dentaire SA, La Chaux de Fonds, Switzerland). The groups were provided in [Table 1]. All experimental groups were subjected to cyclic fatigue resistance test. 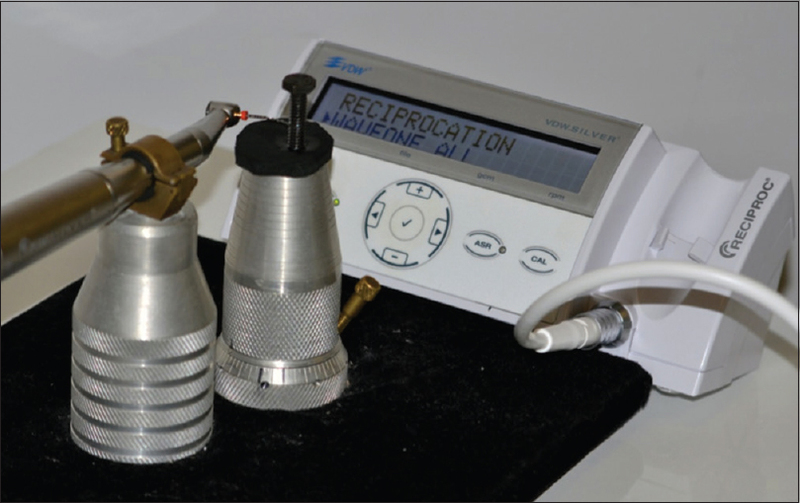 They were activated by a contra-angle of 6:1 (Sirona Dental Systems GmbH, Bensheim, Germany) coupled to an electric motor handpiece (VDW Silver, VDW Dentsply International Inc., GmbH, Munich, Germany) and adjusted to the torque and speed recommended by the file manufacturer. The instrument rotated freely in a stainless steel metal in angled manner, under constant pressure, with no sliding when activated on the metal. The bumps on the metal were used to mark their position and reduce vibration [Figure 1] and [Figure 2]. Through the AutoCAD (Autodesk Inc., San Rafael, CA, USA) software and using the method to determine the curvature of the root canal described by Pruett et al., it was set an angle of approximately 30° and 23 mm radius of curvature. Using the calculation to determine the curvature described by Schneider in 1971, we obtained a curvature angle of approximately 18° [Figure 3]. 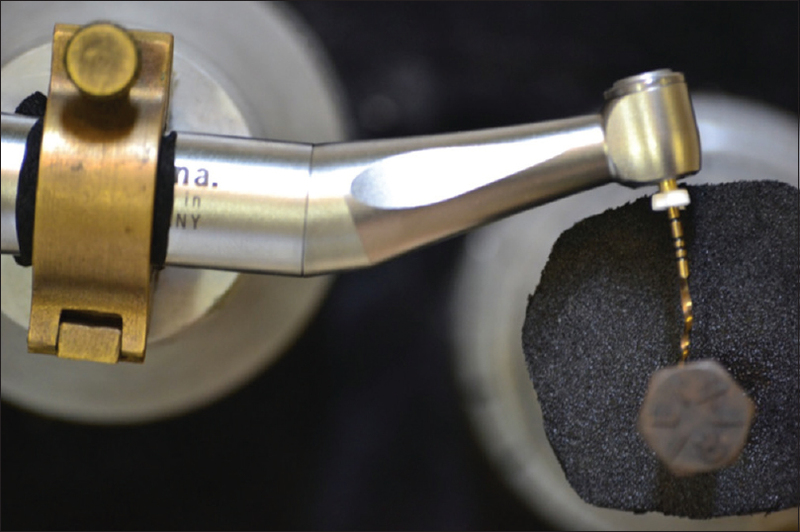 Similar to other studies, a synthetic oil (White Lub Multiuso, Orbi Química Ltda., São Paulo, Brazil) was used to reduce friction of the endodontic instrument to the metal after each use., All files were driven until fracture. The timing of fracture of each instrument was recorded by a stopwatch (HS-80TW, Casio Computer Co., Inc., Tokyo, Japan) to the thousandth of a second and tabulated. Data were evaluated by analysis of variance (ANOVA) with one factor and followed by Tukey's honest significant difference (HSD) post hoc test in software (SPSS 20.0 for Windows, SPSS Inc., Chicago, IL, USA). Statistical significance was set at P < 5%. Descriptive statistics for the experimental groups are listed in [Table 2]. 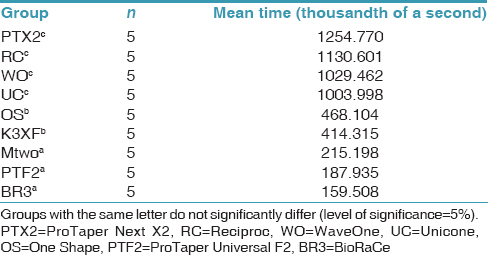 PTX2 had the longest cyclic fatigue resistance mean time, followed by the files RC, WO, UC, OS, K3XF, Mtwo, PTF2, and BR3. Using ANOVA, the results showed that the groups PTX2, RC, WO, and UC were significantly more resistant to cyclic fatigue than the other experimental groups (P< 0.001) but with a mean difference of no significant time with each other. The groups OS and K3XF showed no statistical difference between them (P > 0.05) but were shorter cyclic fatigue resistance mean time than the groups PTX2, RC, WO, and UC, however, higher than the groups BR3, PTF2, and Mtwo (P< 0.01). The average time of fracture of the Groups 1–3 had no statistically significant difference between them although they were significantly less resistant to cyclic fatigue than the other groups (P< 0.01) [Table 3]. The purpose of this study was to compare the cyclic fatigue resistance among nine NiTi files, under continuous rotation and reciprocating motion, in each group using the manufacturer's recommendations. These instruments are commonly used in endodontic practice today because they offer many advantages over conventional stainless steel files; they are more flexible and have increased cutting efficiency. However, despite these advantages, NiTi instruments appear to have a high risk of separation during use, which can be by cyclic or torsional fatigue., Considering the cyclic fatigue fracture, the resistance of these instruments is smaller when their diameter is larger, so the diameter of the instruments was standardized in this study. The influence of cross-section, alloy type, and type of driving motion on the cyclic fatigue strength of NiTi instruments has been the object of several recent studies., Nevertheless, how and why the design of the instrument might influence its behavior under cyclic fatigue stress remains unclear. Cheung and Darvell  showed, in various instruments, that fatigue strength does not appear to be affected by instrument design, suggesting that neither the cross-sectional area nor the shape of an instrument is the primary determinant of its fatigue life. However, other studies have suggested that difference in cross section appears to be an important determinant of cyclic fatigue strength across different files.,, In a study conducted by Plotino et al., RC instruments exhibited significantly greater fatigue strength than WO instruments, which suggests that this difference may be related to the differences in cross-sectional area and reciprocating motion between the two systems. Earlier studies also demonstrated the superiority of RC instrumentation over the WO system in fatigue strength testing ,, and have shown that the angles employed in instrument motion have a direct influence on cyclic fatigue. Kiefner et al. believe another factor that enhances strength in RC and WO instruments is the type of alloy used in their manufacture. The authors showed that a synergistic effect between the M-Wire alloy and reciprocating motion provides a significant increase in cyclic fatigue strength. Dagna et al. compared the cyclic fatigue resistance to RC R25 (VDW), WO Primary (Dentsply), OS (Micro-Mega), and ProTaper F2 (Dentsply), testing 40 instruments of each group. According to the authors, RC R25 (VDW) showed greater resistance to cyclic fatigue, followed by OS (Micro-Mega) and WO (Dentsply) with similar values, and ProTaper F2 (Dentsply), respectively. These results conflict with those of the present study, which did not show significant differences between RC R25 (VDW) and WO Primary (Dentsply), but they performed better than the other two groups, which also obtain no significant difference between them; however, Dagna et al. did their experiment simulating different curvatures, and their results are based on the average mark of the time to fracture in all curvatures used. Pedullà et al. also compared the RC R25 (VDW) system to WO Primary Dentsply and Mtwo 25/0.06 (VDW), getting no statistically difference between the first two systems and significant difference when compared to Mtwo (VDW), like in the present study. Kim et al. compared the RC R25 (VDW) system to WO Primary (Dentsply), obtaining significant difference in favor of RC R25 (VDW) for cyclic fatigue resistance, conflicting with the present study which these two groups showed no statistically difference; however, in the experiment of Kim et al., the angle of curvature used was 45°, unlike that study which used 30°. Gavini et al. performed the fatigue test using the RC R25 (VDW) in continuous rotation and reciprocating motion, and the instruments submitted to the reciprocating motion took longer to fracture, so we can conclude that the type of movement can influence the cyclic fatigue resistance, even in identical files of the same production batch since the fracture time on reciprocating motion (357.56 s) was twice of the same instrument on continuous rotation (163.28 s). Despite the apparent superiority of reciprocating files, the group with the highest time to fracture was PTX2 (Dentsply), also in the study of Saber et al., which analyzed the root shape capacity of the PTX2 (Dentsply) system compared to Hiflex (Coltene) and iBioRace (FKG), the PTX2 (Dentsply) was the system that had the best results with a significant difference from the others by ANOVA and Tukey's HSD post hoc test. These findings can be explained by the small area of cross section of the instrument, which increases its flexibility and gives it more space for debris removal. The BR3 (FKG) in our study had the lowest time to fracture, but we should consider that the instruments of this group were triggered at a higher speed (600 rpm) than the others since so was determined by the manufacturer. Following the methodology employed, it can be concluded that the instruments PTX2 (Dentsply), RC R25 (VDW), WO Primary (Dentsply), and UC L25 25/0.06 (Medin) are more resistant to cyclic fatigue than OS L25 25/0.06 (Micro-Mega), K3XF 25/0.06 (Sybro), Mtwo 25/0.06 (VDW), PTF2 (Dentsply), and BR3 (FKG), when using the manufacturers recommendations to speed and torque. Iqbal MK, Kohli MR, Kim JS. A retrospective clinical study of incidence of root canal instrument separation in an endodontics graduate program: A PennEndo database study. J Endod 2006;32:1048-52. Parashos P, Gordon I, Messer HH. Factors influencing defects of rotary nickel-titanium endodontic instruments after clinical use. J Endod 2004;30:722-5. Peters OA, Barbakow F. Dynamic torque and apical forces of ProFile. 04 rotary instruments during preparation of curved canals. Int Endod J 2002;35:379-89. Tripi TR, Bonaccorso A, Condorelli GG. Cyclic fatigue of different nickel-titanium endodontic rotary instruments. Oral Surg Oral Med Oral Pathol Oral Radiol Endod 2006;102:e106-14. Capar ID, Ertas H, Arslan H. Comparison of cyclic fatigue resistance of nickel-titanium coronal flaring instruments. J Endod 2014;40:1182-5. Pedullà E, Grande NM, Plotino G, Pappalardo A, Rapisarda E. Cyclic fatigue resistance of three different nickel-titanium instruments after immersion in sodium hypochlorite. J Endod 2011;37:1139-42. Kim HC, Kwak SW, Cheung GS, Ko DH, Chung SM, Lee W. Cyclic fatigue and torsional resistance of two new nickel-titanium instruments used in reciprocation motion: Reciproc versus WaveOne. J Endod 2012;38:541-4. Arens FC, Hoen MM, Steiman HR, Dietz GC Jr. Evaluation of single-use rotary nickel-titanium instruments. J Endod 2003;29:664-6. Pedullà E, Grande NM, Plotino G, Gambarini G, Rapisarda E. Influence of continuous or reciprocating motion on cyclic fatigue resistance of 4 different nickel-titanium rotary instruments. J Endod 2013;39:258-61. Cheung GS, Darvell BW. Low-cycle fatigue of NiTi rotary instruments of various cross-sectional shapes. Int Endod J 2007;40:626-32. Grande NM, Plotino G, Pecci R, Bedini R, Malagnino VA, Somma F. Cyclic fatigue resistance and three-dimensional analysis of instruments from two nickel-titanium rotary systems. Int Endod J 2006;39:755-63. Ray JJ, Kirkpatrick TC, Rutledge RE. Cyclic fatigue of EndoSequence and K3 rotary files in a dynamic model. J Endod 2007;33:1469-72. Pedullà E, Franciosi G, Ounsi HF, Tricarico M, Rapisarda E, Grandini S. Cyclic fatigue resistance of nickel-titanium instruments after immersion in irrigant solutions with or without surfactants. J Endod 2014;40:1245-9. Higuera O, Plotino G, Tocci L, Carrillo G, Gambarini G, Jaramillo DE. Cyclic fatigue resistance of 3 different nickel-titanium reciprocating instruments in artificial canals. J Endod 2015;41:913-5. Saber Sel D, Abu El Sadat SM. Effect of altering the reciprocation range on the fatigue life and the shaping ability of WaveOne nickel-titanium instruments. J Endod 2013;39:685-8. Kiefner P, Ban M, De-Deus G. Is the reciprocating movement per se able to improve the cyclic fatigue resistance of instruments? Int Endod J 2014;47:430-6. Dagna A, Poggio C, Beltrami R, Colombo M, Chiesa M, Bianchi S. Cyclic fatigue resistance of OneShape, Reciproc, and WaveOne: Anin vitro comparative study. J Conserv Dent 2014;17:250-4. Gavini G, Caldeira CL, Akisue E, Candeiro GT, Kawakami DA. Resistance to flexural fatigue of Reciproc R25 files under continuous rotation and reciprocating movement. J Endod 2012;38:684-7. 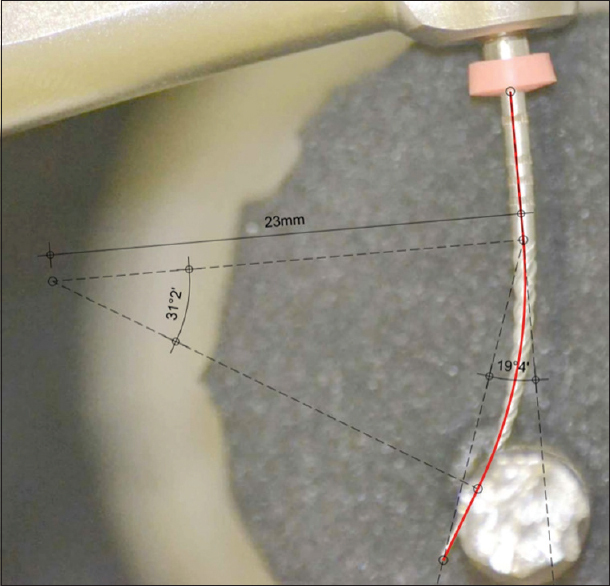 Saber SE, Nagy MM, Schäfer E. Comparative evaluation of the shaping ability of ProTaper Next, iRaCe and Hyflex CM rotary NiTi files in severely curved root canals. Int Endod J 2015;48:131-6. Paqué F, Musch U, Hülsmann M. Comparison of root canal preparation using RaCe and ProTaper rotary Ni-Ti instruments. Int Endod J 2005;38:8-16.